Cork County Council continues energy efficiency drive. Cork County Council is delighted to announce its partnership in an EU project titled‚‘elighthouse‘. This project aims to increase energy efficiency together with the use of renewable based solutions in the Northern Periphery and Arctic Area. The project, which is co financed by the European Regional Development Fund (ERDF) through the Northern Periphery and Arctic (NPA) Programme 2014-2020, will run from 1st April 2016 to 31st March 2019. The ‘elighthouse‘ project will tackle the growing problem of global warming and increasing emissions by bringing added value to the Sustainable Energy Action Plans (SEAP) of the partner towns and regions. Project actions will support increased energy efficiency in buildings (40% of EU energy consumption) and increase the uptake of renewable energy, thus decreasing carbon dioxide emissions. 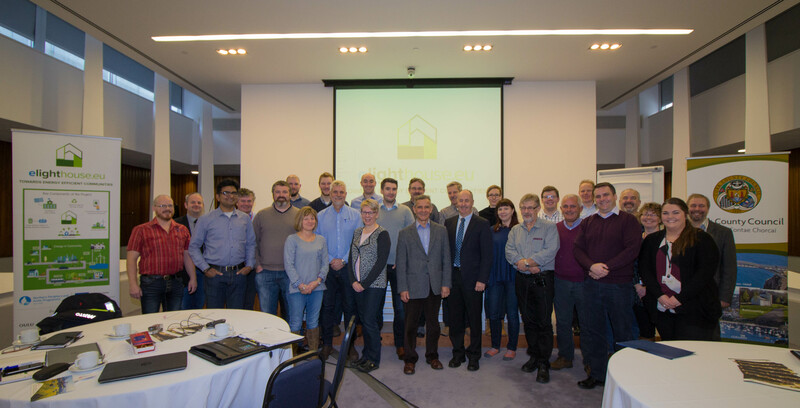 The project kicked off in Finland on April 26th and 27th 2016 where work on elighthouse officially commenced with an objective set in how the defined goals would be achieved. Ten different partners accross various disciplines from six European countries formed a consortium covering the following nations: Finland, Ireland, Sweden, Norway, United Kingdom and Greenland. The consortium met again this November 9th and 10th 2016 in County Hall, Cork to discuss the progress of the project and to officially launch the project website www.elighthouse.eu. Ambitious Sustainable Enerergy Action Plan (SEAP) targets have been set by partner regions which can only be achieved by the increased energy efficiency of buildings, modern public lighting and the efficient recycling of waste. Enhancing energy efficiency of buildings can be achieved by retrofitting public buildings and influencing the decision-making of both retrofitting of residential buildings and new houses. Further, elighthouse will raise awareness of energy efficiency and encourage stakeholders in the regions to use best practises gathered. With a consortium of 6 NPA regions and 10 project partners, the goal of elighthouse is to support and follow-up the retrofit of more than 300 public buildings. In the private sector with the consultation of building supervisory authorities, the project aims to influence the energy efficiency decision makers of over 2000 residential houses. Consideration will also be given to waste to energy streams and relevant case studies developed. Improved local and regional monitoring methodologies and practices would greatly enhance the effectiveness of the SEAP's already developed. The elighthouse project will tackle this problem by providing guidelines and tools to reliably and efficiently calculate those important figures annually. By showing good examples of good codes-of-conduct such as municipality citizenship,‘e-lighthouse‘ partners will encourage other local and regional organisations to sign the new joint Covenant of Mayors and to commit to energy saving at the political decision-making level. Speaking at the launch,Cllr Alan Coleman, Vise President of Energy Cities, said ‘Cork County Council has led the way in both promoting and implementing energy efficiencies. This was recognised only last week with the presentation of the SEAI Public Sector Award 2016, acknowleding on a National stage the incredible undertakings of the Cork County Council. We are the first Local Authority in Ireland to develop and implement an Energy Management System that is fully certified to ISO 50001. A challenge considering the requirement to develop a system that could deal with the diversity of services provided by the Council. This system required the development of performance indicators for a diverse array of services ranging from road maintenance and street lighting to running leisure centres and libraries. Cork County Council has provided a roadmap and template, allowing other local authorities to follow in their footsteps. We are always seeking new and innovative ways to deliver on energy efficiencies and utilise renewable energies‘.